If you want to experience the Oregon coast but are pressed for time, head for the Yaquina Head Outstanding Natural Area. This picturesque wave- and wind-scoured 100-acre spit of land, or head, offers a variety of attractions, including a lighthouse, tide pools and whale watching. Plus a great sandy beach is only a short drive away. Start your visit at the Interpretive Center, which will teach you about the area's natural history–like how a lava flow created the basalt rock headland some 14 million years ago. You'll also learn about the lighthouse, local marine life and tide pools. 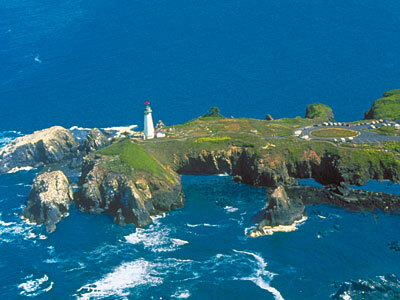 Next, head about 1/4 mile west on Lighthouse Drive to the 93-foot-high Yaquina Head Lighthouse, Oregon's tallest. Climb the 110 steps to the top for a close-up look at the 12-foot-tall beacon lens (its light is visible from 19 miles out at sea) and an excellent view of the Pacific Ocean. Those who make it to the top of the 127-year-old structure can buy an “I survived the climb” button to prove it! California gray whales migrate south past the lighthouse from December through February and north from March through May. Other whales stay in the area through the summer. Before you leave, don't miss the tide pools, both the natural ones at Cobble Beach (on the south side of the lighthouse parking lot) or the man-made pools at Quarry Cove (back near the Interpretive Center). My favorite is Cobble Beach, which, as its name implies, is full of cobblestones. They're sometimes covered with seaweed and barnacles, so be careful. Handicapped-accessible Quarry Cove, however, has concrete paths that wander through the pools. The best viewing time is during low tide. The Interpretive Center has tide tables. Staffers can help you identify tide pool denizens like green anemones, purple urchins, hermit crabs and starfish. If you have time, travel south on U.S. Highway 101 for a mile or so, then turn west onto Oceanview Drive. About 1/4 mile down the road, you'll find Agate Beach Wayside, a state park with a sandy beach. It's a great place to unwind after a busy day of sightseeing! The Natural Area is just west of U.S. Highway 101 on the north-central Oregon coast, 3 miles north of Newport and 55 miles west of Corvallis. It's open every day from dawn until dusk. The Interpretive Center is open daily. The lighthouse is open daily rom 12 to 4p.m. in the winter and 10a.m. to 4p.m.summer. For information, call 1-541-574-3100.